An exhibit exploring the “allure of the unassuming” opens Thursday, Feb. 7 in the East Oregonian Gallery at the Pendleton Center for the Arts. 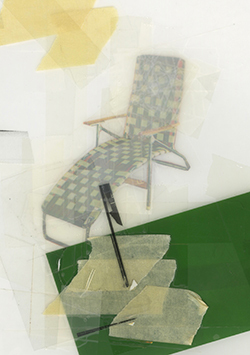 The public is invited to a free opening reception from 5:30 to 7 p.m.
Cory Peeke’s collages are deceptive in their spare simplicity, but the ephemera and marks resonate with the viewer in unusual ways. Titled “On the Tip Of My Tongue,” Peeke’s work speaks to that something that you feel that you know, but somehow can’t quite articulate. They contain very little and yet everything necessary. They are like a memory, a trace of something past, an intangible, fleeting connection to something greater than ourselves – something we can’t quite name. Peeke received his bachelor of fine arts degree from Kendall College of Art and Design and his master’s degree in fine arts from the University of Idaho. He has exhibited his work in numerous solo and group exhibits throughout the U.S. as well as Europe and South America. His work has been published in L’art du collage au Coeur de la creation, Published by P.J. Varet Editions- Musee Artcolle, France, Rapsodia: A Magazine of Arts and Literature, Dialogist, Agave Magazine and Plastikcomb among other publications. His works are included in the permanent collections of King County, Washington, Eastern Oregon University, Lockhaven University, Whitman College and the International Museum of Collage, Assemblage and Construction. He is Professor of Art at Eastern Oregon University in La Grande, Oregon where he also serves as the Director of the Nightingale Gallery. Peeke’s work is represented by Gallery I M A in Seattle, Washington. “On the Tip of My Tongue” also features a small, representative sampling of work by Evan Clayton Horback, Lita Kenyon and Melinda Tidwell, artists who Peeke thinks are addressing collage work in interesting ways. New work by Emily Taylor Cress will be on display in the Lorenzen Board Room Gallery. All of the February exhibit events are made possible through a partnership with Barhyte Specialty Foods, which makes admission free for everyone. More information is available on the center’s website.